I think this makes it official. I am OB.SESSED with cheeseburgers. First it was cheeseburger pies (only the second most popular recipe on YTGT last year). And now it’s cheeseburger pizza. Yes, my friends. Cheeseburger Pizza has landed. And, you’re gonna love it. 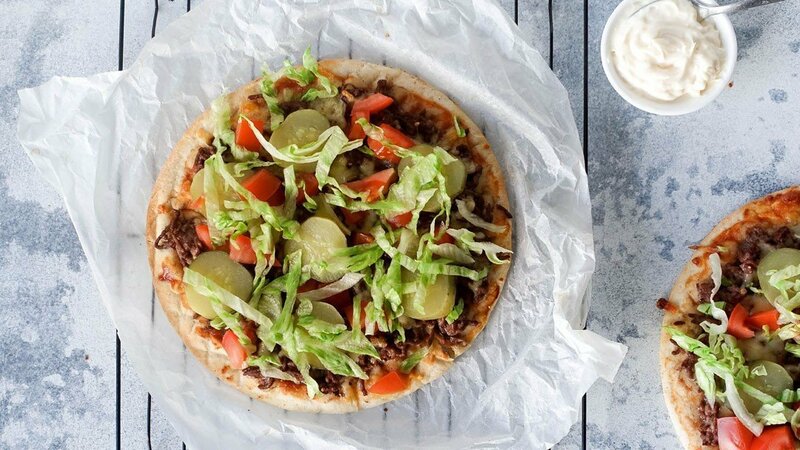 What exactly *is* cheeseburger pizza, you ask? Just your two favourite foods hanging out and being insanely delicious. Cos, did I mention, CHEESEBURGER…PIZZA! In fact, cheeseburger pizza may even be better than an *actual* cheeseburger. Cos, all the taste of a burger with no kitchen splatter to clean up after dinner. I know. I’m a genius (just don’t ask me to solve a math problem). Cheeseburger on a Pizza. Trust me. It totally works. You need it in your life, you just don’t know it yet. And when you try it, come back and let me know. It’s seriously, the best thing since cheeseburger pie. Ammaright? Two of your favourite foods hanging out together. Trust me, Insanely delicious. You didn’t know this. But you need, cheeseburger pizza in your life. Preheat your oven to 180C/350F and line a baking tray with baking paper. Finely chop the onion, then combine the mince, onion and cheese in a large mixing bowl. Arrange 2 pita bread on the baking tray and spread a thin layer of tomato sauce (ketchup) on to the pita bread. Spoon an equal amount of mince mixture on each pita bread using the back of a spoon to flatten the mixture. Place in the oven for 10 minutes or until the meat is cooked through and the cheese melted. Meanwhile use a knife to thinly shred the lettuce and slice the tomato and gherkins. Set aside. 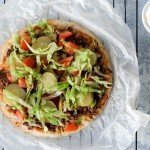 When the pizza has cooked remove from the oven and arrange the lettuce, tomato and gherkins on top. Drizzle with mayonnaise or mustard. My oven takes just under 10 minutes to heat to 180C. If yours takes a little longer, you’ll need to add 5 minutes on to your cook time. But don’t stress. The whole thing will still take less than 30 minutes – yay! You could also make this recipe using a regular pizza base or Lebanese pita bread. I prefer Greek pita because it creates a base that tastes like regular thin and crispy pizza. You seriously, gotta try it. So YUM! Want to make this recipe gluten free. Easy! Just use a gluten free pizza base or wrap instead. 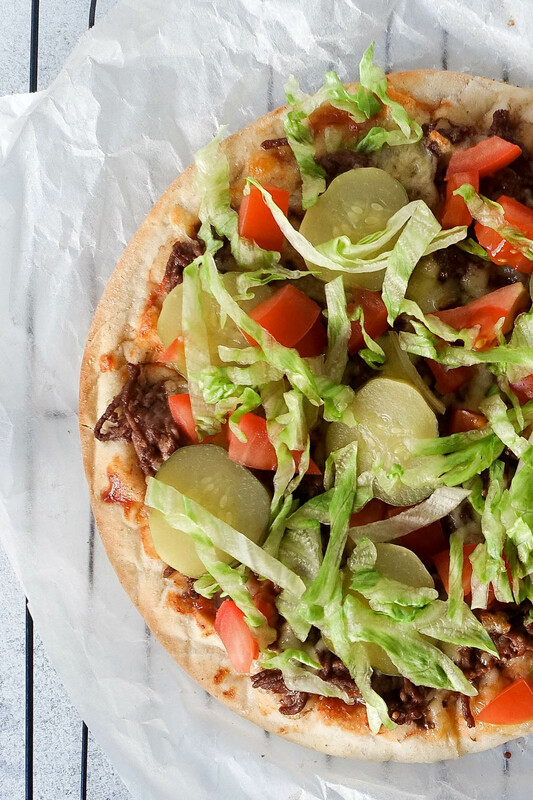 P.S – Want a whole weeks worth of dinners just like this amazing Cheeseburger Pizza? Grab your FREE quick and easy weeknight dinner plan right here.